SABR sells and distributes Loftware WebAccess, for remote Barcode Label printing and RFID encoding integration with Loftware Print Server®. Loftware WebAccess (LWA) is a browser based software application that enables companies to extend and reliably deploy a secure and controlled role based access label printing system, throughout their global enterprise to anyone with Internet access. Its inherent design makes a robust plug and play remote printing system possible when combined with Loftware's Print Server printing infrastructure and open system web based server technologies. User access can be permitted or forbidden on a per user, per label basis for 3rd parties, contract manufacturers or even seasonally based suppliers. The Loftware WebAccess Client provides secure access to label printing through username and password authentication. It works with existing corporate active directories such as LDAP, to restrict the label printing function only to authorized users. Using an existing corporate active directory accelerates implementation, eliminates maintenance of a separate user access management system, and minimizes IT support requirements. This also allows access to label printing to stay current with any changes within a corporate user community. The WebAccess Client also uses Role Based Access Control (RBAC), to restrict individual user access to only those label templates and label printers for which they have been authorised. The RBAC feature, is customer configurable, and allows companies to set up as many user roles as they may require, including creation of unique roles for each individual user. This also prevents any unauthorized printing of 'valid' company labels from within the company or among its business partners. The Client also makes use of Secure Sockets Layer (SSL) cryptographic protocols, to provide secure communication over an enterprise WAN/LAN network or Internet. Sensitive label data is therefore protected from unauthorized access by brand counterfeiters. 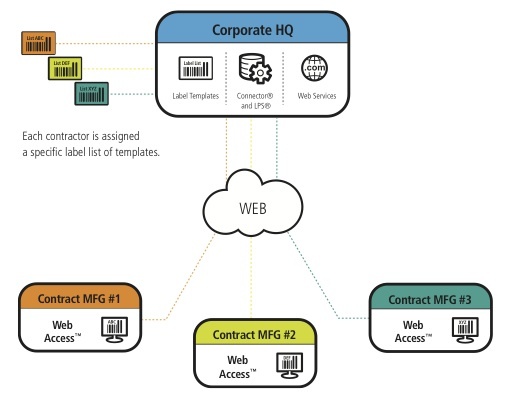 The Loftware WebAccess Client uses Loftware's Service Oriented Architecture (SOA) infrastructure to exchange label print requests and label print data using Web Services. These Web Services support interoperable machine to machine interaction over a network and the communication between different software applications (e.g., the web browser, Loftware Print Server) running on a variety of platforms and/or frameworks. This enables the Client to be deployed wherever it is needed without regard to the client platform operating system. The Client eliminates the need to deploy and manage client software on the user work station or PC desktop, therefore lowering IT desktop management costs. The hardware requirements to use the Loftware WebAccess Client are minimal, thus eliminating the need to invest in robust end-user systems. It supports common web browsers that are either shipped with PC workstations or are available as free downloads. The Loftware WebAccess Client features Cascading Style Sheets (CSS), written in XSL (eXtensible Stylesheet Language), that allows companies to readily modify the Clients 'look and feel' to match corporate standards. The user interface can be adapted to feature a corporate logo, colors, and font styles. The Client also features Browser Localisation, which allows the user experience to be tailored to its native language, thus ensuring lower cost, shorter training time and faster remote deployment.